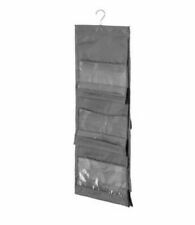 IKEA 100% POLYESTER DRAW SHELF WARDROBE ORGANISER BOX | DARK GREY. They are fantastic for organising wardrobe or chest of drawers. Tidy your draws and wardrobe with them! Do not wash, bleach, tumble dry, iron or dry-clean. 1x 30 Slots Storage Box Organizer. Inside 30 slots help you to organize laundry accessories orderly. Foldable design for easy storage and saving storage space. Convenient to use and lightweight to carry. Channel Islands, Isle of Man, Isle of Scilly, Isle of Wight, Scottish Isles, Scottish Highlands and N.Ireland, Republic of Ireland. Integrated sleeve for hanging from pole or two hanging hooks. 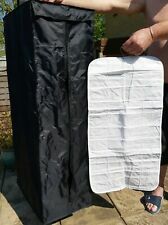 A handy multi-pocketed hanging tent tidy. For sale is a set of Ikea Skubb 6 piece storage box set. 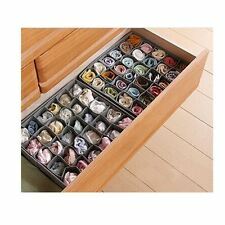 The boxes can help to organise socks, belts and jewellery in either a wardrobe or chest of drawers. These can also fit Ikea’s Malm chest of drawers (80cm wide). IKEA SKUBB Storage Case Wardrobe Clothes Organiser Underbed - BLACK or WHITE. Do not wash.Do not bleach.Do not tumble dry.Do not iron.Do not dryclean.Wipe clean with a mild soapy solution. Good to know. Fabric: 100% polyesterInsert: Reinforced polypropylene plastic. Key features. 3pcs Storage Box. Soft and breathable cotton fabric. Detail Image. Quality is the first with best service. What You Get We will try our best to reduce the risk of the custom duties. Inside organiser for socks, underwear and other small things. Fits perfectly in STUVA drawers. If the box gets dirty, you can wash it by hand in cold water, 30°C. Hand wash, cold (30°C). Care instructions. Combines with other products in the SVIRA series. IKEA of Sweden. Do not bleach. Do not tumble dry. Do not wash. Insert: Reinforced polypropylene plastic. Care instructions The material in this product may be recyclable. 30 Slots Wardrobe Storage Drawer. You Will Receive : 1x 30 Slots Storage Box Organizer. Ideal to organize underwear, such as briefs, shorts, socks, handkerchiefs, etc. Inside 30 slots help you to organize laundry accessories orderly. Style: hanging. color: grey. A very functional storage bag. We are always making efforts to providing better products and service. Item code: 6section1 Description: This is the perfect solution! The hanging organisers simply hang onto any wardrobe rod. No screws or fittings The organiser has enough space to accommodate clothes or shoes. Features: Ideal for hanging in the wardrobe Hook and Velcro loop fastening for easy installation Luxurious breathable cream nylon with brown trim Great for creating additional storage space Separate storage compartments with boarded inserts into each shelf to keep your garments and shoes in place neatly Folds down instantly if not in use for easy storage 6 Section Shoe Organiser: H120 x W15 x D28cm. You Will Receive : 1x 30 Slots Storage Box Organizer. Ideal to organize underwear, such as briefs, shorts, socks, handkerchiefs, etc. Inside 30 slots help you to organize laundry accessories orderly. New ALGOT Trouser hanger. Trouser hanger ALGOT. The trouser hanger has 9 bars. Width: 60 cm. Depth: 38 cm. Length: 61 cm. Width: 38 cm. Height: 2 cm. 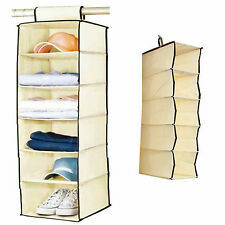 This is for 2 (two) Top Quality 6 Shelf Canvas Hanging Wardrobe Storage Organiser Tidy. Ex - British Army. These are high quality, very strong, made-to-last, wardrobe shelf / storage / tidies. Strong Velcro fastens to the rail. Ikea Rosali Hanging Storage. Navy blue with a delicate white baroque floral print. Never used. Divide it. With this handy hanging organiser from Ikea’s SKUBB range you can make the most of your wardrobe and always know where even the smallest things are. The hook and loop fastener makes it easy to hang up on the rail in your wardrobe and move when required. 1 16 Pockets Storage Organizer (Organizer ONLY). 16 Pockets Storage Organizer to keep your accessories neat and organized. Ideal for organizing bras, socks, ties, underwear, scarf, etc. Fashionable design makes it a perfect decoration for your room.